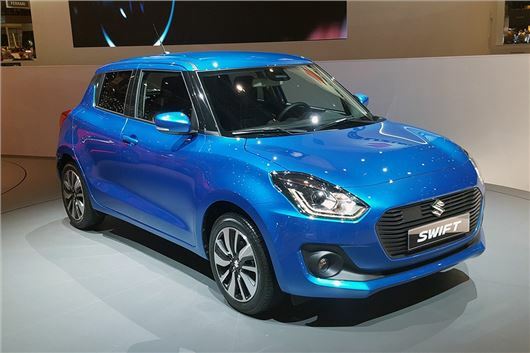 Suzuki has announced that the all-new Suzuki Swift will go on sale in the UK in June 2017. Lighter, more powerful and more efficient, the new Swift will cost from less than £10,000. Two engines will be available – the 1.2-litre 90PS DualJet petrol, from the existing Swift and the 1.0-litre BoosterJet petrol, also offered in the Baleno. Both engines will be available with Suzuki’s SHVS hybrid system, which provides a mild economy boost. All-wheel drive will be available, though it’s geared towards improving all weather traction more than challenging off-road terrain. Inside, the new Swift has a more spacious cabin with more shoulder space front and rear than the outgoing car. Standard equipment for the base model includes Bluetooth, DAB radio and electric windows. Going for higher trim levels adds useful extras like adaptive cruise control and auto emergency brakes, as well as a touchscreen system with Android Auto, MirrorLink and Apple CarPlay smartphone connectivity, plus navigation. Final pricing details and specifications will be announced nearer the on sale date of June 1 2017. You state that " Both engines will be available with Suzuki’s SHVS hybrid system, which provides a mild economy boost." This is incorrect - only the "conventional" 1.2 engine has this option ! As we correctly state, both the 1.2 and the 1.0 BoosterJet engine will be available with the SHVS system for this new generation Swift.